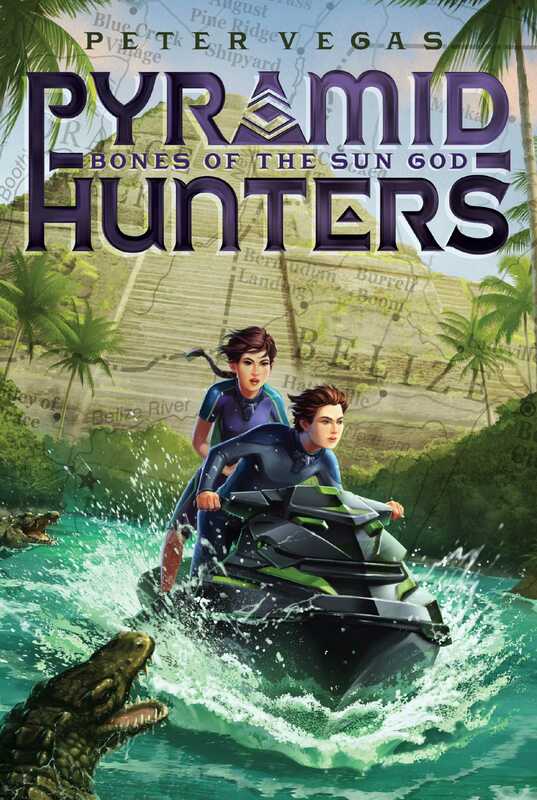 After his adventures in Egypt, Sam Force is finding it nearly impossible to return to everyday life at boarding school—especially now that he knows his parents are still alive. However, his Uncle Jasper has banned him from setting off in search of them until he can go with Sam, but Sam’s not sure he can wait that long. When a man turns up at his school—a man he last saw in the Egyptian desert—he knows he can’t. Sam needs to continue the hunt for his parents. Luckily, his friend Mary Verulam has a plan, and before he knows it he’s on his way to Belize. However, from the moment he lands, Sam finds himself being followed and threatened. When his research leads him to a local crocodile park and an encounter with the leader of a mysterious crocodile cult, things become really dangerous. Sam is left to wonder if he’ll ever be able to locate his parents—and if there is anyone he can trust. SAM BROKE OUT IN A sweat as all eyes turned in his direction. Behind him, he heard Andrew Fletcher snickering. They hadn’t been friends since Sam beat him to a spot on the four-man rowing team. Mr. Stevenson’s voice filled the classroom, and yet he hadn’t seemed to speak very loud at all. Sam got to his feet, wondering if voice projection was a skill they taught at teachers college. He pushed in his chair, taking care not to scrape the legs on the floor. It was one of Mr. Stevenson’s pet peeves. No point in making the situation worse than it already was. Mr. Stevenson watched Sam approach, holding the note distastefully between two fingers. He waved it in the direction of the nervous junior who had delivered the message. The boy understood the meaning and scuttled for the door. As Sam got to the front row, Mr. Stevenson screwed up the piece of paper and tossed it into the wire basket in the corner of the room. It was a good shot, no rim. Sam hoped the mutterings of appreciation breaking out around the room might be enough to snap the teacher out of his foul mood. But they weren’t. “Settle down,” Mr. Stevenson growled. “If you are not Mr. Force, then you should be attempting this!” He waved the black marker in his other hand at the algebra equation scrawled across the whiteboard. Sam heard Andrew Fletcher mutter something from the back of the class. Sam assumed he wasn’t meant to reply, but he could think of hundreds of reasons to interrupt Advanced Algebra. For him, math ranked even higher than bathroom cleaning on his list of hated tasks at his boarding school. “Well?” Mr. Stevenson pointed the marker at Sam accusingly. As Sam left the room, Mr. Stevenson spoke again, loud enough for everyone to hear. Sam grinned as he heard Andrew Fletcher’s muttered protests. He wouldn’t make a very good study partner, but it served him right. As Sam walked down the deserted corridor, he reflected on his teacher’s words. Mr. Stevenson was right. You weren’t called for during class unless it was very important. So what was he walking into? THE LONG OAK BENCH CREAKED as Sam sat down. Looking around the office, with its floor-to-ceiling oak panels, old paintings, and grandfather clock, Sam realized that nearly everything in the place was creaky. That included Miss Ingle, the headmaster’s secretary. According to one of the boarders, whose older brother had also attended St. Albans, Miss Ingle had been at the school since it was founded. Sam didn’t think that was possible. It would mean she was . . . He couldn’t work it out—maybe he could have if he’d paid more attention in algebra—but he knew it would make her very old. St. Albans was a grand school, if you were into that sort of thing. Huge old oaks and big stone buildings covered with moss dotted a well-manicured lawn. Sam thought it belonged in England, fifty years ago, not modern-day Boston. Not that Sam had ever been to an English boarding school. He could hardly remember anything about England. His last trip to that country had been over five years ago, before his parents died. No, not died, he corrected himself—disappeared. Five years ago, Sam’s life changed forever when his parents were murdered. He’d been left to spend summer vacations in Cairo, with his uncle Jasper, and the rest of the year at St. Albans School for Boys. But in July, everything changed again. In just a few days he had uncovered a conspiracy involving pyramids around the world and the famous Ark of the Covenant. He had learned his parents were involved, but more important for Sam, he’d been given hope that they were alive. His world had turned upside down, but almost as quickly as it had changed, he’d had to go back to being a schoolkid. It was impossible. Not with what he knew. After his Egyptian adventure, he’d been desperate to keep going, to stay on the trail of his parents. But days had passed by with no progress. His uncle convinced him to return to Boston—a temporary situation, he had promised Sam, until he was able to get the appropriate resources in place. That had been six long weeks ago. Even Mary, who had been so keen to help him solve the mystery of his parents and the secret behind a worldwide network of pyramids, had lost interest. After Sam had returned to Boston, they had been in touch almost every day via e-mail, as they researched the information they had uncovered in Egypt. But in the last couple of weeks, things had changed. Her messages were less frequent, and the subject matter had become routine stuff about school and music. It was as if she had put their adventure behind her and moved on. But Sam couldn’t. Not while there was still hope his parents were alive. Sam had a nagging feeling that his summons to the headmaster’s office was to do with the events in Egypt. Since his return, he hadn’t felt the same about anything, especially schoolwork. His grades were dropping almost as fast as his bangs. And both had become a source of tension. St. Albans liked its boys’ hair to look as well-groomed as its lawns, and both were cut often. Sam’s hair had already grown beyond an acceptable length when he returned from Egypt. It had been one of the first things the head teacher had commented on: “Be sure you’re front of the line when the barber visits this weekend, Force,” he had commanded. After that, it had become a thing for Sam. He found an excuse to miss the barber’s school visit that weekend, and the next visit a few weeks later. In the outside world, Sam’s hair would not have even received a second glance, but within the pristine walls of St. Albans he began to turn heads. It was a small thing, but to Sam it had become a symbol of defiance. A personal reminder that he didn’t belong there anymore. Not when there were so many unanswered questions waiting for him in the outside world. By the time the door to the headmaster’s office opened, Sam had prepared himself for a showdown about his hair. So he was totally unprepared when the two men inside greeted him with a round of applause. The headmaster was clapping politely, but the man beside him looked like he was about to cry with joy as he slapped his small hands together so fast they were a pink blur. He was a short man, but anyone looked short next to the towering Mr. Billington, St. Albans’s headmaster. “Come in, Sam, have a seat,” Mr. Billington said. He immediately sat down, looking relieved to have an excuse to stop clapping. Sam eyed the chair in front of him, but the short man darted forward, gripped his hand, and started shaking it with the same energy he’d put into his clapping. Very confusing, more like it, Sam thought as he watched his hand being pumped up and down. The man spoke with an accent, and something about him was familiar. Then Sam placed it. He was St. Albans’s music teacher, Mr. Ber-something. “Mr. Beroduchi has just received an e-mail informing us of your success, Sam,” the headmaster said, holding up a printout. At the top, Sam saw an old-fashioned logo. Sam had no idea what was going on. He studied the hyped-up music teacher, then the headmaster, searching for a sign that it was a stupid joke, but Mr. Beroduchi interpreted the look in a totally different way. “Overwhelmed” wasn’t the word. “Freaked-out” was more accurate. Sam sat, and the beaming music teacher pulled his chair close to Sam and continued his excited chatter. “Yes, we must do that,” the headmaster agreed. Sam could see Mr. Billington wasn’t as swept up in the moment as the music teacher. Fair enough. Opera? Wasn’t that something fat old men did? There was a good reason Sam hadn’t recognized Mr. Beroduchi straightaway. In his time at St. Albans, Sam had had nothing to do with the music department. He had zero interest in learning anything musical, and, until that moment, the music department had shown zero interest in him. Sam’s mouth dropped, and his mind scrambled, but before he could form the most basic excuse, the headmaster stepped in. “Ah yes, of course,” said Mr. Beroduchi. “This evening? Where?” asked Sam. Sam’s head spun. Three weeks in Switzerland? He tried to keep calm, but it was impossible. Three weeks in Switzerland. At an opera academy he’d never heard of. When Sam couldn’t carry a tune in a bucket. Sam knew exactly what this e-mail was, and he needed time to study it. He received a final supersized handshake from Mr. Beroduchi before being dismissed. A glance at the grandfather clock, as he hurried past the historically old secretary, told him he was about to be late for rowing training, but he couldn’t bring himself to care. Sam slowed and read the letter, then studied it line by line, letter by letter. By the time he reached the minivan that would take him to training, he’d found the hidden message. It was a trick his uncle had taught him, using the first letter of each line. But Jasper wasn’t behind this. Sam knew the author of this e-mail because she had put the initial of her first name on the last line. Sam was holding his get-out-of-jail-free card. Today I am thrilled to confirm your scholarship with us. This is an honor you really should be quite proud of. As you may be aware, for an opera singer you’re unusually young, but we were impressed by your audition tape, and our teachers see advantages in launching your operatic future as soon as possible. To that end, we would like you to join us in two days’ time in Switzerland. May I suggest you pack and prepare for your departure. It is booked for this evening. Your documents are at the airport information desk in your name. May I wish you well and say how happy I am to line up this chance for you. Peter Vegas lives in Auckland, New Zealand, with his wife, daughter, two dogs, and a motorbike. He draws and writes at night and practices the dark arts of advertising during the day. His little corner of the Internet is PeterVegas.com. Peter Vegas is the author of the Pyramid Hunters series.